It is no secret how much I love the Total Baby app for the iPod, iPhone, and iPad. It has, however, changed a lot since I wrote my last review. there have been some significant updates. Also, I now have a iPad (thanks again, Pop Culture Dad!) 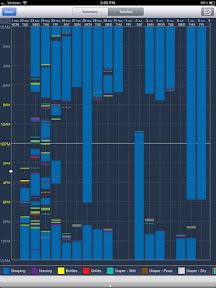 and am able to witness the pretty cool iPad interface. Like a typical lawyer, I have to point out that this "review" is merely an update of new features, and not meant as a stand-alone review of the app. For a more full update, this post should be read along with the original review. 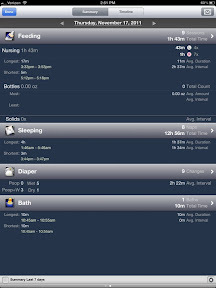 The Total Baby app now includes timers for pumping and keeps a log of your breast milk. Based on how it is stored, the app even tells you when the milk expires. Honestly, I haven't been totally diligent in the use of this feature, but when I have used it, it is glorious. 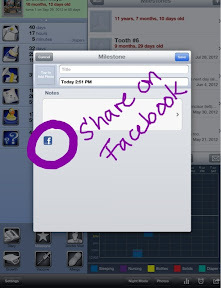 Just typed up a huge diary or milestone entry and want to share it with all your Facebook friends? No worries, just click on the Facebook share button, and you can annoyimpress all your Facebook buddies with your little one's newest and greatest accomplishments, without any need to copy/paste. 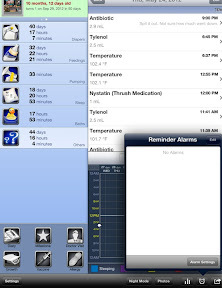 If your last entry was for giving baby Tylenol, but you can't remember when to give the next dosage, just set a reminder. This is the one feature the ItzBeen timer had that this app was missing. Now it is totally superior in every way. As before, this app remains my favorite. 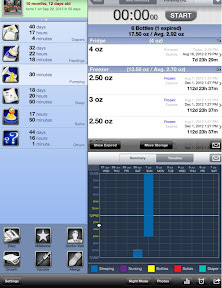 Pop Culture Baby has now gotten too old for me to use this app for every feeding and diaper change, but I still use it for important things like medications, doctor appointments, vaccination records, growth, milestones and diaries. I still use it with Pop Culture Preschooler, too. Now that she's a little sassafras, the "Diary" feature comes in handy for capturing all the crazy things she says and does.